This is a sponsored post brought to you by Cost Plus World Market. All opinions are always my own. Last Friday, I shared that my dream is coming true and we are finally going to start work on our kitchen. Now, let me say that we don’t have a bad kitchen. It’s just not my style and since the day we moved into our home I knew I wanted to make some minor changes. Like the countertops and upgrade our sink and faucet and install a beautiful backsplash. You’ll notice our current kitchen is black, white, and stainless steel. With warm wood and lots of bright white I think I’ll be so much more in love with our kitchen! Well the major details have been set and today I want to share with you all the decor details. I can have a beautiful kitchen, but its not complete without beautiful decor to really dress it up. Today, I’m sharing my vision board of how I’ll decorate our kitchen once its updated. This is in conjunction with the World Market Spruce up your Space Sweepstakes. So, here are my picks for our kitchen update! I’m in love with the brand new Maison Des Artistes, Urban Dwellings, and Glasgow Fog lines. From beautiful french decor to decorating for small spaces and chic decor my heart flutters. You’ll notice I chose a mix of items from the three new lines. And take a look at the Pinterest board I created because it has a lot more than just the 15 items I’ve listed above. If I were to win the $5,000 shopping spree I would invest in all new dishes, bowls, cups, silverware and more. Our kitchen would look magazine worthy! Make sure you enter to win a $5,000 World Market’s Spruce Up Your Space Sweepstakes plus a personal shopping experience and design consultation with one of our top design bloggers. Plus, the fun doesn’t stop their. Their will be 3 First Prizes: $1,000 World Market gift cards! Even with $1,000 you could really make over a room! 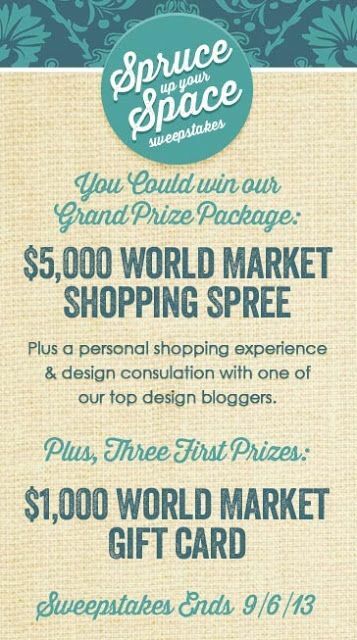 I would love to hear what room you would transform if you won the $5,000 shopping spree with World Market! Get social with Cost Plus World Market on Facebook, Twitter, Pinterest, Instagram &Tumblr! Disclaimer: This is a sponsored post brought to you by World Market. I was compensated to write this post; however, all opinions are my own–I truly LOVE World Market! That’ll be beautiful! I love World Market for all their fun textures and pretty patterns! Thanks Kelly! I love World Market too! Your kitchen is cute! But I know you will make it even cuter somehow. I love your WM picks… esp the chevron plates and the 3 shelf cart… honestly I heart it all! You have great taste and so does WM. Awe thanks Malia! I can’t wait to finish our kitchen to start decorating it!! !